Online registration is closed. You are still welcome to join us and register onsite. The Virginia Chapter of ASLA would like to invite you to an educational event in Richmond on April 18th, 2019. 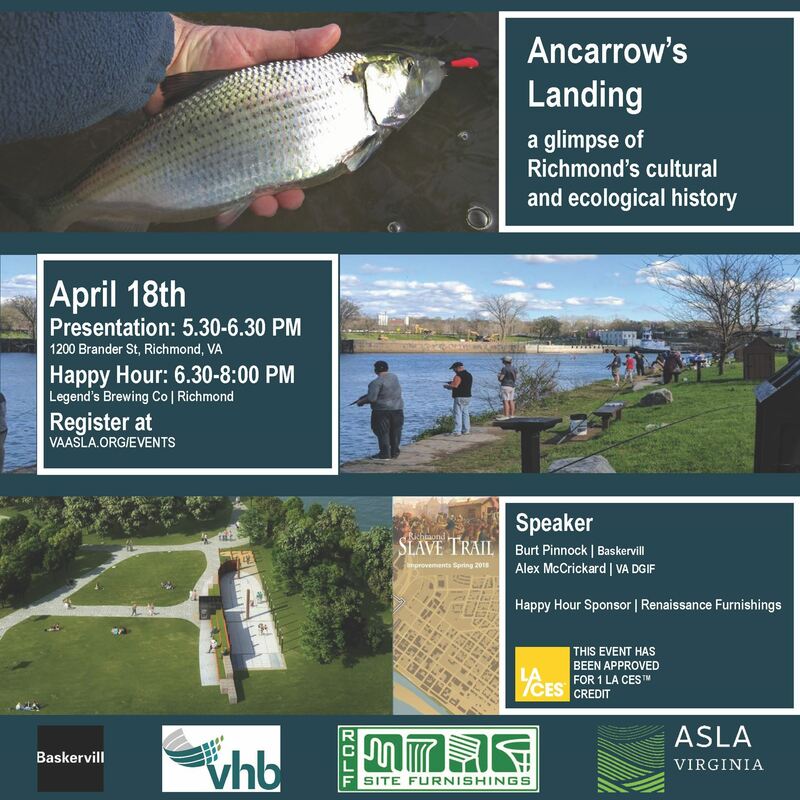 This session will offer the opportunity to learn about the cultural and ecological history of Ancarrow’s Landing, a wonderful park along the James River in the City of Richmond. Alex McCrickard from the Virginia Department of Game and Inland Fisheries will discuss migratory spring fish species and teach participants angling methods to catch Shad, Perch, and Striped Bass from the banks using a Fly Fishing demonstration. Additionally, Burt Pinnock of Baskervill will present the history of Ancarrow’s Landing and upcoming plans to improve the site as part of the Richmond Slave Trail. Learn about Anadromous fish and their spring migration up the James River. Discover fly fishing and spinning rod techniques for novice anglers. See why April at Ancarrow’s Landing is the best fishing spot in town! Learn how your actions can help protect these species and their environment. Hear about an important cultural landscape project and its design concepts. Discover the history of Ancarrow’s Landing leading to its current trail head and park. The educational session will be from 5:30-6:30 with a networking happy hour to immediately follow at Legend Brewing Co from 6:30-8:00.